It seems to me in this day and age that people are not listening to the news or the research or the gross ads on TV about smoking being a way to sign your own death certificate. Young people are still taking up smoking and older people steadily refuse to quit. 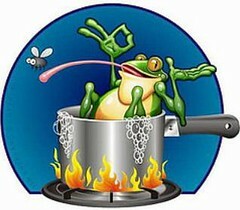 How to boil a frog: If you boil the water first, it’s hot and the frog although burned will jump right out and get away, so to boil a frog you put him in the pot while the water is cool and as it gradually heats he will enjoy the water cause it feels so good – until it is all to late and he cannot get out and boils himself into frog soup. Cigarette smokers are the same: they start smoking to appear cool or because they tell themselves that they need it to stay calm. This is the cold water… even though they see all the ads about the bad health effects (the water is getting warmer) of smoking they ignore them cause it feels so good. Then when it is all too late and they have the cancer… You get the picture. However, if a cancer appeared or they became impotent on their first cigarette, they would stop and never come back (the boiling water).